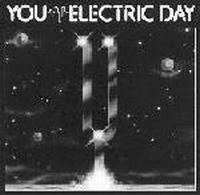 First studio album by YOU, "Electric Day" is in the straight lineage of the 70's electronic Berlin School. The music is mainly based on trippy pulsating electronic sequences weaving hypnotic textures. The German duo adds however more rhythm, futuristic sonorities and upbeat percussions typical of this period. This is also partly due to the participation of Klaus Schulze collaborator and ASHRA member Harald Grosskopf at drums. The title track features a fast frenetic loop over a dreamy soundscape, in the vein of KLAUS SCHULZE-meets-HELDON. Then comes the very nice "Magooba". A little softer piece, with distorted guitar solo and slight oriental touches, which can remind ASHRA at times. Back to rapid sequencing with the more rhythmic "Son Of A True Star". This average track is nonetheless a bit repetitive and does not contain many variations. The short "Sequential Spectrums" parts are slow drone contemplative pieces. On the contrary, "Slow Go" is the longest track of the record. This composition is a lengthy electronic improvisation built around Grosskopf's drumming, and has therefore reminiscences of TANGERINE DREAM's "Madrigal Meridian" suite from their 1978 album "Cyclone". The ender "Zero-Eighty-Four" features mysterious strange sci-fi sonorities and sounds rather... bizarre. For a first studio album, "Electric Day" is quite pleasant. The German duo is just beginning to develop its own musical identity here. In 1979, YOU were one of the only few bands to propose such quick sequenced hypnotic electronic music. Their elder brothers TANGERINE DREAM were still in their progressive rock period before they turned more melodic in the 80's, while KLAUS SCHULZE was changing direction. Although uneven and not genuinely innovative, this first opus is very futuristic and spacey. Recommended to 70's sequenced electronic music lovers!